The four-try bonus point will feel like scant consolation for Hartpury after they succumbed to a heavy defeat to Premiership-bound Bristol Rugby at the Gillman’s Ground. After a wobbly start, Hartpury battled their way back into the game with a three-try salvo to go 17-7 up but the Greene King IPA Championship winners showed their class in the second half as the hosts struggled to get their hands on the ball. Hartpury did show flashes of excellent rugby in front of a record-breaking crowd but they were also plagued by errors and poor decision-making. Right from the whistle, Bristol showed their attacking ambition and as they took every opportunity to unleash their back-line, winger Ryan Edwards twice threatened in the 22 with full-back Mike Wilcox needing to make a crucial, and somewhat painful, intervention. It took only five minutes for the visitors to trouble the scoreboard. With Hartpury seemingly rooted to the spot as they failed to react quickly enough as the ball was moved out of the breakdown, scrum-half Andrew Uren sniped through a gap for a somewhat soft, albeit deserved, try. Fly-half Callum Sheedy converted. With the hosts plagued by silly errors and Bristol seamlessly linking backs and forwards with prop Soane Tonga’uiha and number eight Jordan Crane both punching holes, it looked like it was only going to be a matter of time before they struck again. Hartpury, however, did well to halt the drive after conceding a penalty and committed defence saw them win back possession, kick-starting a complete swing in territorial advantage and team fortunes. After number eight Darrell Dyer claimed a line-out cleanly in the Bristol 22 in the 18th minute, Hartpury drove powerfully and, as it splintered, flanker Iain Grieve was able to drive over, with the visitors’ defence now looking lethargic. Only three minutes later, Bristol looked sluggish again as former Bristol favourite Grieve charged up field and impressive lock Alex Craig was in support to carry into the 22. The ball was moved quickly through a succession of rucks and after Dyer set the platform, James Williams was almost able to dance through. A show and go by Bristol-bound Hartpury scrum-half Harry Randall then almost reaped the try but it was hard work by the pack that eventually made the breakthrough, Craig to the fore again before prop Dan Murphy barged over. Williams converted for a 12-7 lead. The hosts now had their tails up and with Randall making a nuisance of himself and Bristol clearly rattled, Hartpury were able to kick on again from another solid line-out, Murphy completing his double. Williams failed to convert. Bristol still looked like a major threat on the counter though and it took some trademark tackling and strong rucking from centre Steve Leonard – back in action after missing the majority of this year’s campaign injured – to initially stop them in their tracks. Their pinpoint passing and electric pace, coupled with some poor Hartpury positioning, eventually saw the home defence infiltrated though, winger Ryan Edwards in acres of space to accelerate over. Sheedy converted to cut the gap to 19-14. And they were in again in the dying seconds of the first half as a charged down drop-goal attempt by James Williams gave Uren the chance to cut loose and get within metres of the line. Although he was hauled down just short, Bristol capitalised on the penalty awarded with number eight Crane surging off the back of the line-out drive and offloading to Tonga’uiha, who showed great strength to barge over the line. Sheedy’s conversion gave the visitors a 21-17 half-time advantage. 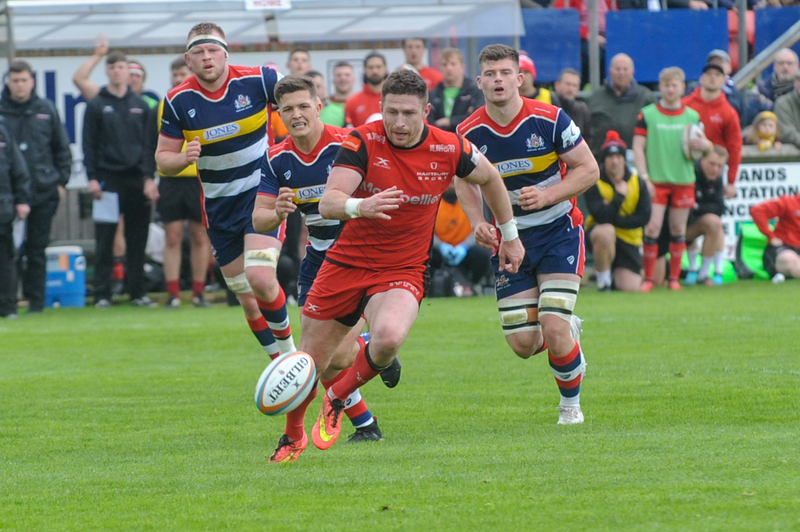 Bristol reinforced their dominant position only two minutes into the second half as Hartpury were again undone by Edwards’ electric pace, Crane’s lovely hands and their own dodgy decision-making. Sheedy converted the winger’s try for a 28-17 lead. A deft offload by Crane allowed lively full-back Jordan Williams to cruise in for another try only four minutes later, Sheedy adding the extras. The see-saw nature of this encounter struck again, however, as winger Maliq Holden’s dancing feet crafted an opportunity and Leonard was in receipt to glide into the 22 with Randall ready in support as the centre offloaded in the tackle to go over for the try. The conversion was good to cut the deficit to 35-24. Hartpury looked more settled as they won a series of penalties and used the set piece and then the pick and go to make patient inroads but a silly error saw the ball go loose, and with the hosts caught out by the quick tap, they were frustratingly soon back defending their own line. A fundamental failure at the scrum allowed Bristol in again, with Crane dotting down for a converted try after lively running by Billy Searle, and on 71 minutes, Jordan Williams swerved in, Searle converting, to see Bristol stretch away to 49-24. A well won scrum looked to have given Hartpury the necessary platform to have the last word but they were driven backwards at a series of tackles and turned over. Awarded a penalty, Crane re-gathered possession from a scrappy line-out before both locks carried on, but it was the fresh legs of replacement number nine Rhodri Williams that claimed the try. Searle converted but Lemi could not then add the extras as Williams completed a quickfire double in the dying seconds to wrap up a handsome win. Hartpury are at least safe in the knowledge that they have another season of Championship rugby to look forward to next season, having eventually finished in 10th spot and been on the rough end of some very tight games – their tally of seven losing bonus points testament to that. A well-earned rest now awaits the lads before pre-season gets everybody back to business in a few weeks time. Hartpury: Wilcox, Holden (Sheldon 67), Leonard, Eves, Seabrook, Williams (Leeming 46), Randall (Cochrane 75); Murphy (Flook 67), Tanner (Stratford 41), Harden (Gibson 57), Craig, Oakley (Quinn 49), Grieve, Langley, Dyer. Bristol: Williams; Edwards, Hurrell, Tovey (Leiua 49), Lemi, Sheedy (Searle 49), Uren (R. Williams 70); Tonga’uiha (Bevington 61), Fenton-Wells (J. Capon 71), Lay 6 (Dawe 64), Joyce, Holmes, Jeffries, Graham (W. Capon 67), Crane (capt).